A couple years ago, the Zika virus startled the world with its until-then unrecognized ability to maim fetuses. A few years before that a camel virus — MERS — began infecting and killing people on the Arabian Peninsula. And a few years before that, H1N1 ignited the first flu pandemic in 41 years. Does it kind of feel like we due for a new disease misadventure? Does Mother Nature have malign plans for 2019? We have plenty of skills at STAT, but predicting the unpredictable is still out of our grasp. Know this, though: If some big new disease breaks out, we’ll be on top of it. In the meantime, here are predictions we can make about some global health issues to watch in 2019. Will the U.S. get a licensed dengue vaccine? Will Sanofi pocket a coveted prize? Sanofi’s Dengvaxia has had a roller-coaster ride since it became the first dengue vaccine to reach the market in 2016. Dengue places a major strain on the health systems of countries where it circulates and the vaccine was quickly licensed by 20 of them. Late in 2017, the company announced it had discovered a problem some dengue experts had predicted could materialize with this vaccine. While it lowered the risk of hospitalization for severe dengue infection in children who had already had at least one bout of the disease, it actually elevated the risk for children who were vaccinated before ever having dengue. In the Philippines, which had rolled out the vaccine broadly, its use was suspended and the country has threatened legal action. There have been reports that public confidence in all vaccines there has plummeted in the wake of the controversy. Experts who advise the World Health Organization recommended the vaccine be given only to children who have been previously infected with dengue. But there isn’t currently a point-of-care rapid test available for prior infection and having to test before vaccination really complicates mass vaccination efforts. Others think there’s another prize in the company’s sights. Dengue is on a list of neglected diseases that the FDA encourages pharmaceutical companies to work on. Companies that bring to market a new drug or vaccine targeting these diseases earn a priority review voucher, which entitles a company to expedited FDA review of a future drug or vaccine submission. These vouchers can be sold; recent publicly disclosed prices range from $80 million to $125 million. Though that’s a fraction of what it cost to develop a new vaccine, why would a company leave that on the table? The FDA is giving Dengvaxia an expedited review, meaning a decision must be made by the end of April. How do you solve a problem like Ebola? There may be a priority review voucher in the cards for an Ebola vaccine in 2019 (or 2020), too, but before we go there, let’s discuss a pressing problem. Conflict-torn North Kivu, in northeastern Democratic Republic of the Congo, is in the grips of the second-worst Ebola outbreak on record. As of Sunday, 574 cases have been recorded; 347 of those people have died. Containing Ebola in what is effectively a war zone has taxed the skills of the world’s best Ebola fighters. People of the region — where a U.N. peacekeeping force has been stationed for nearly two decades — don’t trust their government and see little incentive to cooperate with outsiders. 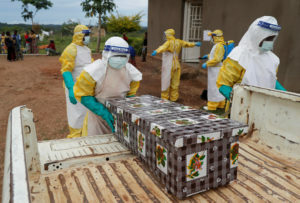 Some parts of the region are simply too dangerous for Ebola response workers to operate in and U.S. government employees have been barred by the State Department from working in the outbreak zone. As a result, some people who have had risky contact with cases have refused the recommended vaccine and have evaded the Ebola response team’s efforts to monitor their health. Rather than going into the specialized Ebola treatment centers, some people who have been diagnosed have fled, exposing the people who care for them during their illness to the dreadful disease. Fleeing patients have also spread the virus to new locations. In December, it became apparent that transmission was moving southward towards Butembo — a city of more than a million people — and Goma, a major transportation hub for East Africa. The specter of an outbreak in a large city in a highly insecure region is daunting even to people who have contained Ebola outbreaks for decades. And it’s raised real concerns about the availability of the experimental vaccine being used to combat the outbreak. Merck, which makes the vaccine, maintains a stockpile of 300,000 doses. “I don’t believe that’s adequate for urban outbreaks,” Dr. Peter Salama, who heads the WHO’s emergencies program, told STAT recently, suggesting he thinks the size of the stockpile will need to be revisited. The vaccine, though still unlicensed, is now an accepted tool in the arsenal deployed against outbreaks caused by the Zaire species of Ebola viruses. (It would not work against other strains.) Merck began a rolling submission to the FDA for the vaccine in November, saying it hopes to complete the filing sometime in 2019. Ebola is also on FDA’s neglected diseases list and the agency would likely also grant it an expedited review. Whether the FDA’s decision comes in 2019 or 2020 will depend on when Merck completes its filing. This vaccine is also in line to earn a priority review voucher. Speaking of challenging problems …. In our global health predictions for 2016, we talked about polio’s long goodbye. At the start of 2018 we asked if this would be the year polio takes its final bow. Er … no. Instead of hitting zero, this year polio went in the other direction. There have been more cases in 2018 — 29, as of Dec. 18 — than there were in 2017, when 22 children were paralyzed by polio. All of the cases were in Afghanistan and Pakistan, two countries that have never managed to arrest circulation of the virus. The people running the effort to eradicate polio worry this is a sign of further erosion to come. They are concerned the world is losing interest in the fight to extinguish polioviruses. “One of our worries is that complacency would become the biggest risk. When you get very near to the end of anything … the enthusiasm wanes,” said Helen Rees, chair of the World Health Organization’s emergency committee on polio eradication. Small wonder: 2018 marked the 30th anniversary of the launch of the polio eradication effort. (By contrast, it took 13 years to eradicate smallpox after the world got serious about the job. To this day, smallpox is the only human disease that’s ever been eradicated.) Multiple targets for stopping cessation of polio have been set and missed. This article is reproduced with permission from STAT. It was first published on December 24, 2018. Find the original story here.